As I mentioned when writing about Modern Romance by Aziz Ansari, I try to stay on top of the dating news by reading both articles and books on the topic. When I saw that Christian Rudder, one of the founders of an online dating site and the author of Dataclysm: Who We Are (When We Think No One's Looking), was coming to Washington, DC — my hometown — to speak about his book, I knew I had to go… and so I did. 1. Short messages are A-okay. 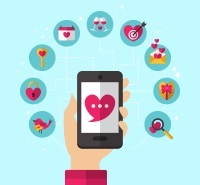 With texting, tweeting, and Instagramming, the world has mostly adapted to a more short-form way of writing to people, and that trend has affected online dating as well. According to Rudder, the average message sent from one user to another is just over 100 characters (shorter than a tweet! ), and the messages that receive the highest response rate are those between 40 and 60 characters long. Now, please take these results with a grain of salt because, if he is only using his online dating site’s data to get his results, and the average age is something under 30, then I might conclude that younger people send shorter messages, and those results may not apply to the population as a whole. 2. Race relations are amplified. In one particularly interesting chapter of the book, Rudder analyzes race. One major finding in this chapter is that white women find white men more attractive than Latino, Asian and black men. It’s obviously not okay to be racist or make racist remarks publically, but the disparity between white people and minorities has never been more apparent, thanks to “big data”. He also showed that when emailing between races, the likely response rate drops, as shown below. Sadly, black women and Asian men seem to fare the worst, at least as far as online dating is concerned. 3. Men and women perceive attractiveness differently. It’s no surprise that men and women view attractiveness differently. In fact, one particular study showed that there is a huge discrepancy between how long men look at women’s profile pictures versus their online dating profiles and how woman do. Who do you think looks at the photos longer? Exactly! 4. Common interests are necessary… but not the ones you might think. We all have a lot of traits that we think are necessary to make a long-term relationship last… and maybe they are. I’m thinking of divisive issues like politics and religion. According to Rudder, though, seemingly innocuous questions such as, “Do you like scary movies?” and “Have you ever traveled alone to another country?” have surprisingly strong predictive power. He says, “In about three-quarters of the long-term couples [the site] has ever brought together, both people have answered [the previous two questions] the same way, either both ‘yes’ or both ‘no.’” I don’t know about you, but I hate scary movies, and I have traveled to another country alone. I wonder if my future partner will say the same! These are some of the salient findings in his book. Did you find any of your own? Can’t wait to read more about online dating? Check out these helpful articles to get more great tips.